Eleven thousand years ago, glacial activity formed five lakes in the shape of outstretched fingers. American Indians believe the lakes came to be when the hand of the Great Spirit touched this beautiful land. Regardless of how they came to be, these lakes are a bountiful four-season delight for locals and visitors alike. 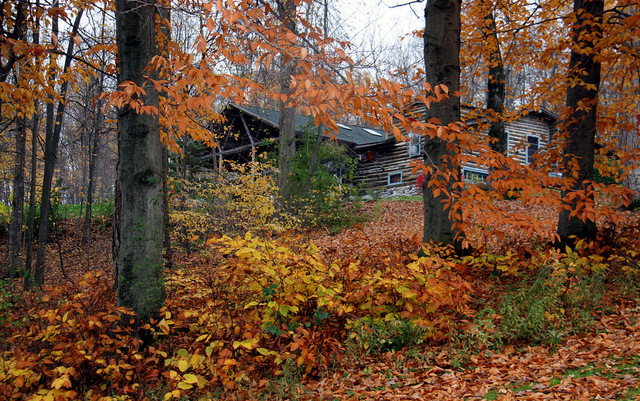 Our destination in the Finger Lakes was the Chalet of Canandaigua. 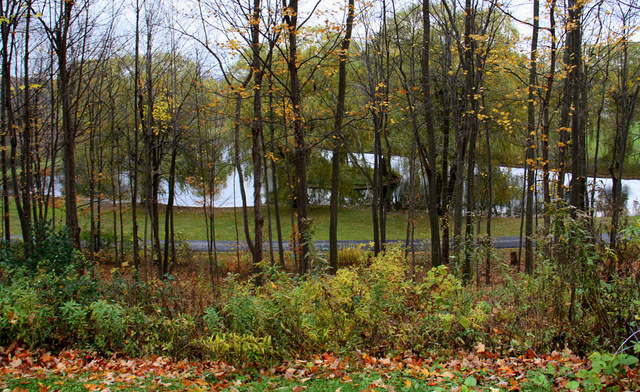 We found it neatly tucked away along the west side of 16-mile long Canandaigua Lake. 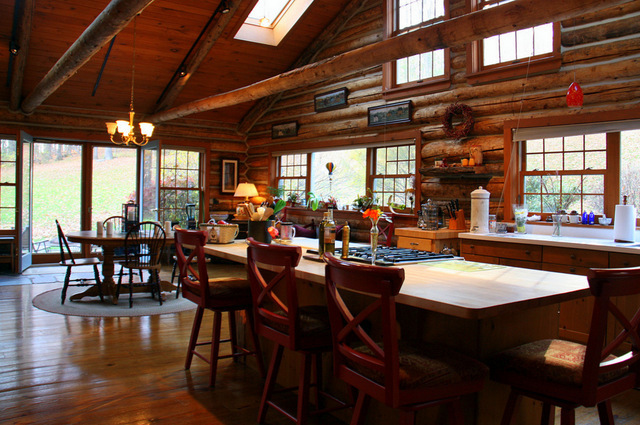 The elegant rustic log cabin sits back from the road on 30 acres of pristine forest fronted by an expansive lawn, winding private road, and a tranquil pond. This little gem was recommended by a reader, who turns out to have a keen eye for pastoral luxury. We arrived for our visit in late fall. It was a chilly and rainy afternoon, and amiable Innkeepers Margaret and Pattie had a welcoming fire rumbling in the hearth. We immediately sensed this was a place we would be happy to write about. 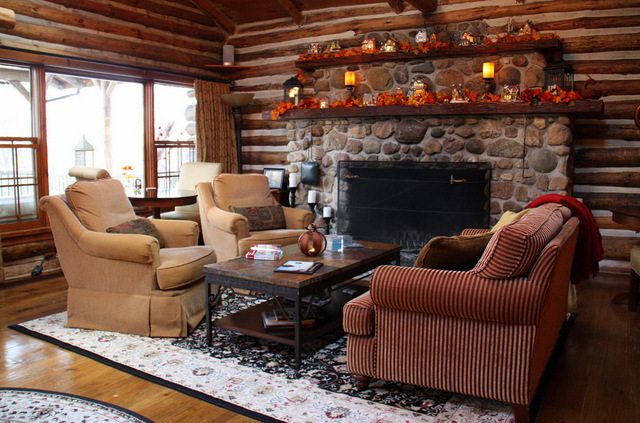 The inside of the chalet is spacious, but exudes an air of intimacy. There are only three guestrooms, so it is possible to occupy the entire building for a family gathering. However, the chalet is popular, so it is necessary to plan ahead to avoid disappointment. Ours was the Lee Suite, but we would have been equally satisfied with either of the other two. 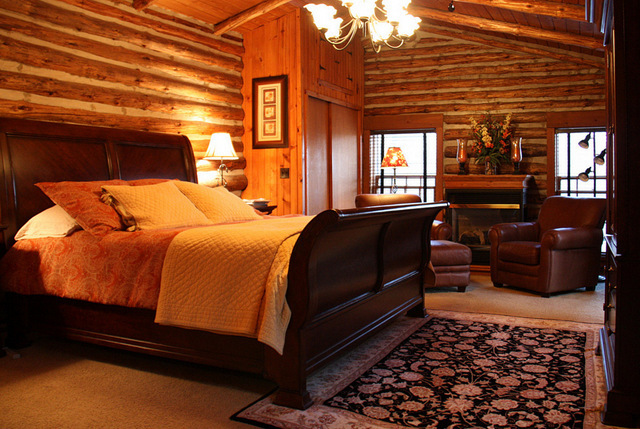 The guestrooms are all spotlessly clean, and the king-sized beds and linens are first rate. Wireless internet access is available free of charge, as are little snacky-goodies. 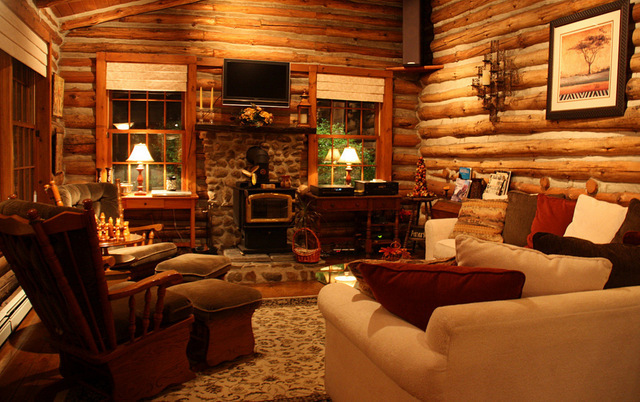 …and the grand living room is ideal for games, chats or just relaxing in front of the fire. The welcome room, where entering guests register, is the site of the DVD and print library, and a great place to find one’s personal serenity space. 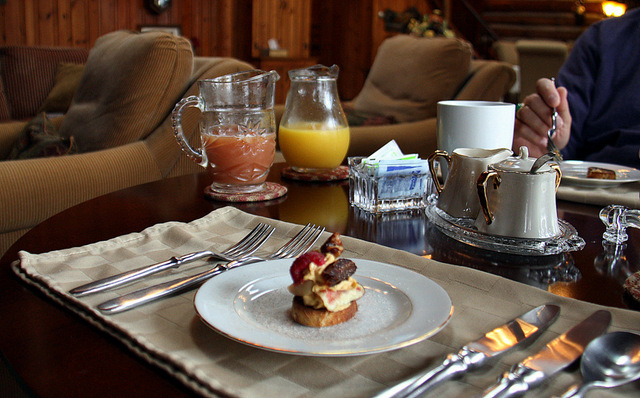 Many of the high-end bed and breakfast inns we review have superb bones and fine furnishings. The thing that separates the real thoroughbreds from the also-rans in this exclusive luxury B&B club is – the breakfast. The day-opening meal at the Chalet is beyond exceptional and exceeds extraordinary. Take for example the Fall Bruschetta which consists of multi-grain cinnamon crostini with pear, fig, date, raspberry and caramelized walnut with pumpkin mousse – oh yeah. 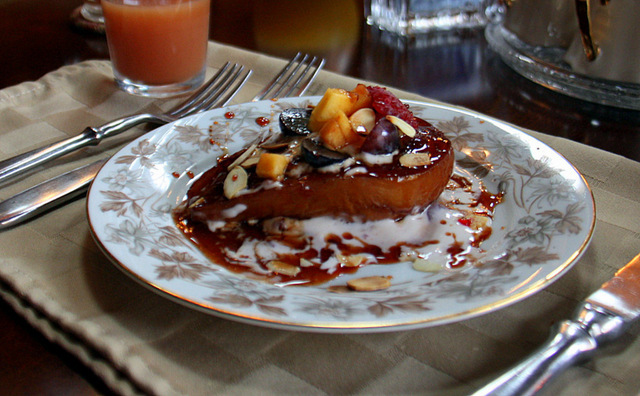 Or how about Poached Bosc Pear in cranberry juice topped with cranberry crème fraiche, grapes, raspberry and toasted almonds – drizzled with pear sauce – oh boy. 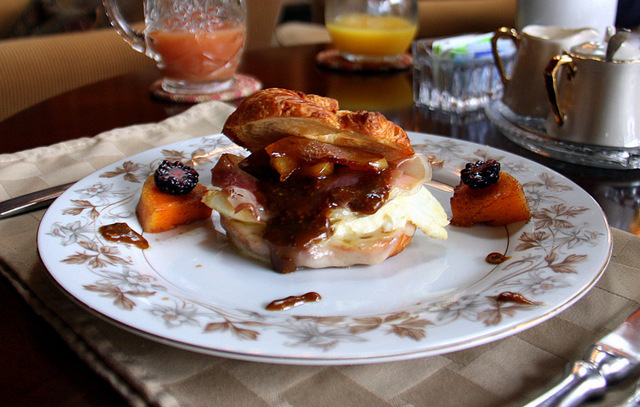 We also enjoyed a Peach Prosciutto Croissant with an egg over-easy and gruyere cheese topped with a whole grain mustard-balsamic sauce, and a side of butternut squash triangles and blackberries. Off the planet! 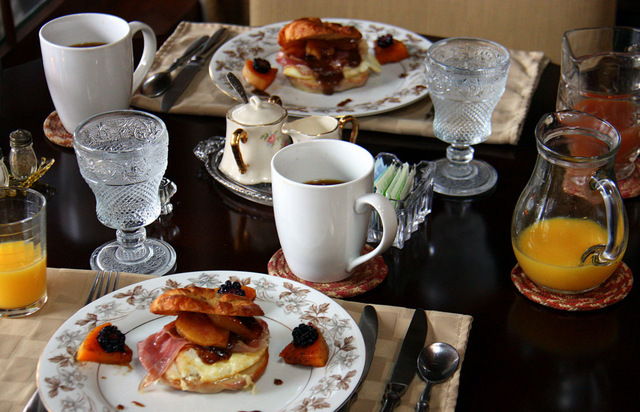 The highly creative innkeepers pride themselves on never repeating a breakfast recipe for any guest. The Finger Lake business people plan early for active spring and summer seasons when vacationers enjoy excellent fishing, boating, golf, hiking, biking, water skiing, etc. 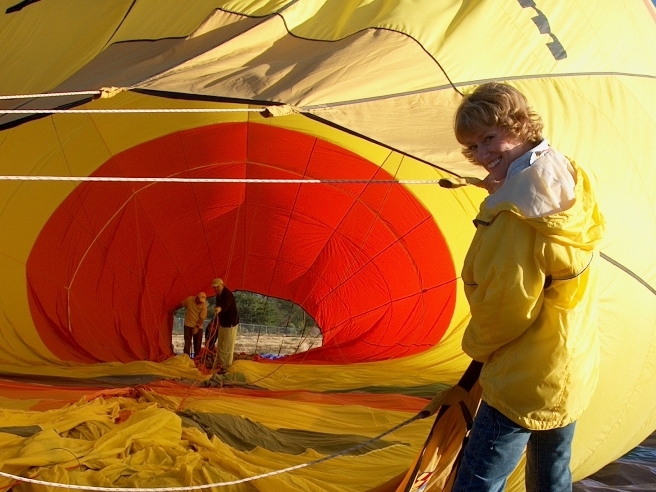 It is even possible to go hot air ballooning from the front lawn of the Chalet. 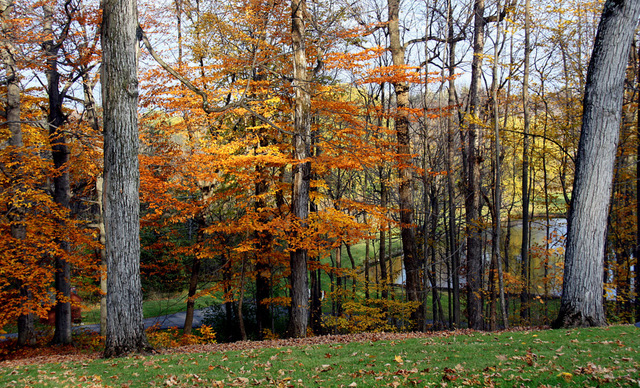 After a hectic summer, autumn is exceptionally beautiful as the lakes reflect the surrounding orchards and hills laden with fruit and forest trees anxious to show visitors their seasonal colors before they settle in for the winter. Winters are cold, and the hills are alive with opportunities for cross country skiing, snow shoeing, snowboarding and downhill skiing at Bristol Mountain. 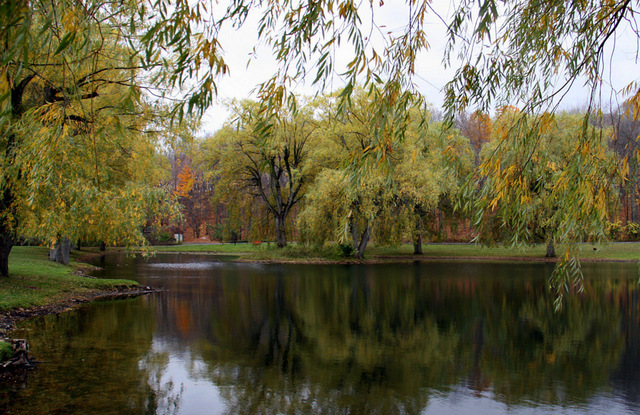 There’s always something great to do in the out-of-doors of north-western New York State. The region is also home to a burgeoning wine industry with guided and self-guided tours of the vineyards and wineries. Click on Canandaigua Wine Trail for a map and details. If you are keen on horses, you can experience the thrill of 160-days of live thoroughbred racing at Finger Lakes Gaming and Racetrack. What we noticed immediately upon entering the town of Canandaigua put a smile on our faces. The town was thriving! All too often as we drive through small-town America, that is no longer the case. We were glad to see over 100 shops, galleries and restaurants with clean windows and streets, all open and welcoming shoppers. Here’s a list of Downtown Canandaigua businesses. Lake Canandaigua is an easy 45-minute drive from airports in Syracuse and Rochester. 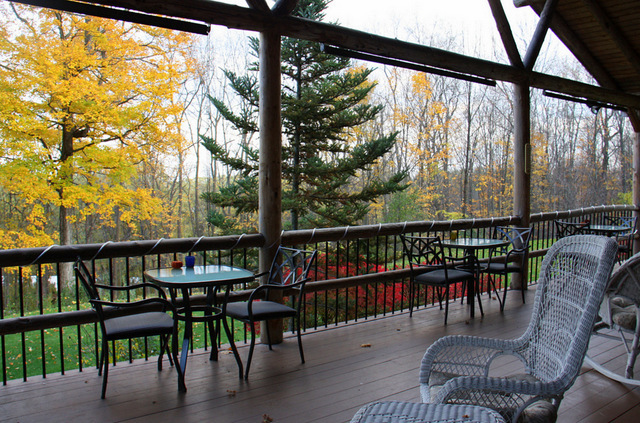 It is a 1.5 hour drive from Buffalo’s International Airport, and 2-hours from Niagara Falls. Take Exit 44 off the NY State Thruway (I-90). For an even more scenic drive take Routes 5 and 20, which run parallel to I-90. 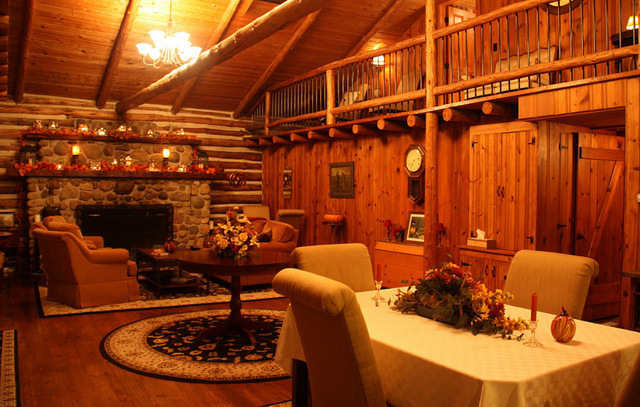 The Chalet is located just minutes from town at 3770 State Route 21. 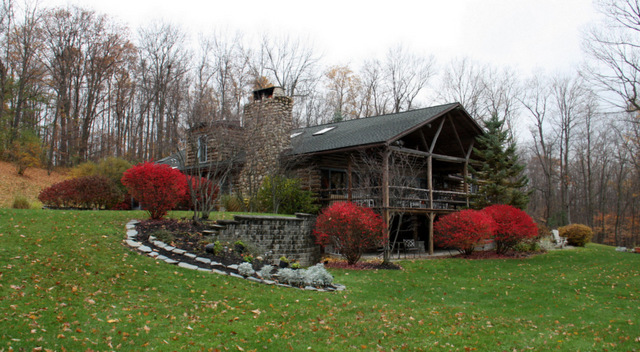 For more information click on Chalet of Canandaigua. Great news. The Innkeepers at the Chalet have been collecting TripAdvisor awards for some time. #1 B&B in Canandaigua, #1 B&B in the Finger Lakes Region. They recently emailed us with the exciting news that they have been notified of being awarded TripAdvisor’s 2015 Traveler’s Choice Award – #4 Best Inn in the United States! Way to go Pattie and Margaret! Well earned. Well deserved. Wherever we travel, we are protected by Allianz Global Assist travel insurance.